Ebeneezer Scrooge would be proud. This is our annual United States Coast Guard edition, and it could best be dubbed the “Christmas Carol” edition as we examine USCG Past, USCG Present and USCG Future. First looking back (but not too far back), and in step with our continued celebration of Maritime Reporter & Engineering News’ 75th Anniversary, Patricia Keefe takes an insightful look at the times, tribulations, leadership and legacy of Thad Allen, past Commandant of the U.S. Coast Guard. Allen is widely considered to be one of the transformational leaders in this position of all time, and by any measure he is the definition of the word ‘leader,’ proven by a steady hand through disasters, both natural and man-made, across two Administrations. Allen was a natural choice for profile in this edition, and the story starts on page 32. Today, as many of you are well aware, the Coast Guard continues its evolution under the guidance of USCG Commandant Admiral Bob Papp, who just a few days ago delivered his final “State of the Coast Guard” address. As Edward Lundquist reports starting on page 28, the Coast Guard is in the midst of a massive rebuilding of its fleet with 91 new cutters at an acquisition cost of about $21.1 billion. The Offshore Patrol Cutter Program (OPC) has gotten much ink of late, with a planned 25 ships under the OPC acquisition project. The contest is now down to three contractors, led by Bollinger Shipyards, Eastern Shipbuilding and General Dynamics Bath Iron works. 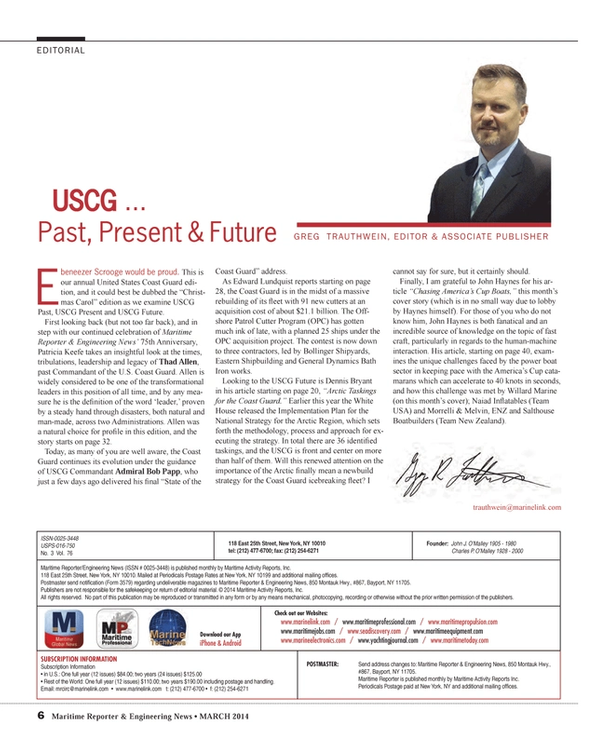 Looking to the USCG Future is Dennis Bryant in his article starting on page 20, “Arctic Taskings for the Coast Guard.” Earlier this year the White House released the Implementation Plan for the National Strategy for the Arctic Region, which sets forth the methodology, process and approach for executing the strategy. In total there are 36 identified taskings, and the USCG is front and center on more than half of them. Will this renewed attention on the importance of the Arctic finally mean a newbuild strategy for the Coast Guard icebreaking fleet? I cannot say for sure, but it certainly should. Finally, I am grateful to John Haynes for his article “Chasing America’s Cup Boats,” this month’s cover story (which is in no small way due to lobby by Haynes himself). For those of you who do not know him, John Haynes is both fanatical and an incredible source of knowledge on the topic of fast craft, particularly in regards to the human-machine interaction. His article, starting on page 40, examines the unique challenges faced by the power boat sector in keeping pace with the America’s Cup catamarans which can accelerate to 40 knots in seconds, and how this challenge was met by Willard Marine (on this month’s cover); Naiad Inflatables (Team USA) and Morrelli & Melvin, ENZ and Salthouse Boatbuilders (Team New Zealand).